The Bureau of Reclamation is seeking applications for two funding opportunity announcements, one for Title XVI Authorized Projects and the other for Title XVI Feasibility Studies. The Title XVI Authorized Projects FOA is for entities that have a congressionally authorized Title XVI water reclamation and reuse project. The Title XVI Feasibility Studies FOA is for entities that would like to develop a new water reclamation and reuse feasibility study. The Title XVI Authorized Projects FOA is available at http://www.grants.gov by searching for funding opportunity number BOR-DO-17-F002. Applicants must have a congressionally authorized Title XVI water reclamation and reuse project. It is estimated that funding will be provided for between 5 to10 projects. Proposals must be submitted as indicated in the application packet by 4 p.m. MST on Dec. 15, 2016. The Title XVI Feasibility Study FOA is available at http://www.grants.gov by searching for funding opportunity number BOR-DO-17-F003. Eligible applicants include state, regional or local authorities, Indian tribes or tribal organizations, or other entities such as a water district, wastewater district, or rural water district. Applicants must provide a minimum 50-percent cost-share for the proposed feasibility study. Proposals must be submitted as indicated in the application packet by 4 p.m. MST on Jan. 5, 2017. 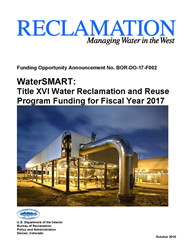 Reclamation provides funding through the Title XVI Water Reclamation and Reuse Program for projects that reclaim and reuse municipal, industrial, domestic or agricultural wastewater and naturally impaired ground or surface waters. Reclaimed water can be used for a variety of purposes, such as environmental restoration, fish and wildlife, groundwater recharge, municipal, domestic, industrial, agricultural, power generation or recreation. Water reuse is a drought resistant water supply and is an essential tool for stretching limited water supplies in the Western United States. Title XVI projects provide communities with a new source of clean water while promoting water and energy efficiency and environmental stewardship. The program is part of the Department of the Interior's WaterSMART initiative. It is Interior's sustainable water initiative that uses the best available science to improve water conservation and help water resource managers identify strategies to narrow the gap between supply and demand. Since 1992, Title XVI funding has been used to provide communities with new sources of clean water, while promoting water and energy efficiency and environmental stewardship. In that time, approximately $667 million in federal funding has been leveraged with nonfederal funding to implement more than $3.3 billion in water reuse improvements. Title XVI has become an important part of Interior's implementation of the President’s June 2013, Climate Action Plan and the Nov. 1, 2013, Executive Order, Preparing the United States for the Impacts of Climate Change. To learn more about Title XVI and WaterSMART, please visit http://www.usbr.gov/WaterSMART.